Fort Worth, Texas — The legendary Will Rogers Memorial Coliseum will see just four more performances of the Fort Worth Stock Show and Rodeo (FWSSR) as the 2019 edition of the event is speeding to a conclusion. After the champions of the 123rd annual FWSSR are crowned on Saturday night, February 9, the next time this rodeo opens, it will happen in the all new Dickies Arena in January 2020. The final four days of rodeo here mean the start of the second go round for the ladies in the WPRA barrel racing. What began with 210 competitors is cut to just 70 for the second go which kicks off on Wednesday afternoon. With two performances a day, the action comes quickly and the leaderboard usually stays in flux right up until the Saturday matinee. Following that performance, the top 12 in the average advance to the Championship Round, held just a few hours later on Saturday night. Wednesday is Cook Children’s Day at the Stock Show, honoring the great work done by the local not-for-profit pediatric hospital which is nationally recognized and one of the largest freestanding pediatric medical centers in the U.S. A large portion of the proceeds from ticket sales on Wednesday are donated to Cook’s and survivors and their families are recognized during each performance. The first perf of the second go for the ladies was the Wednesday matinee and the round got off to an incredibly hot start. 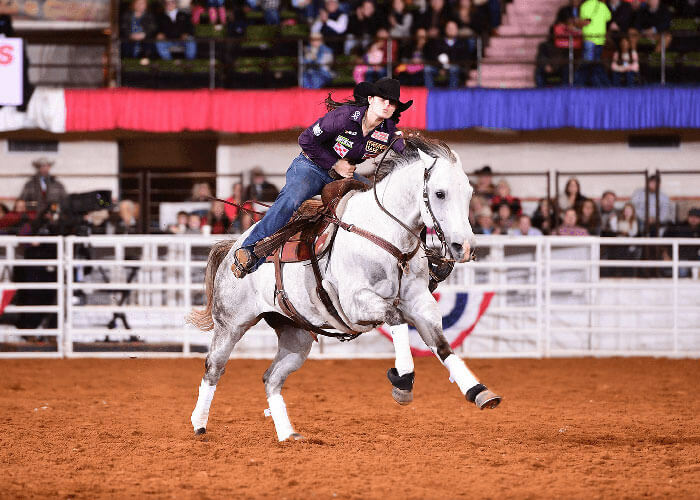 Two-time World Champ and former Fort Worth winner Brittany Pozzi Tonozzi took the early round lead with a blazing fast time of 16.37 seconds. 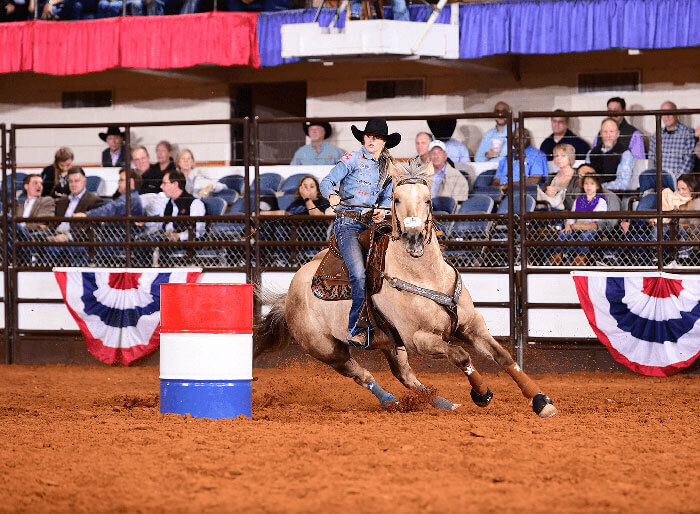 Pozzi Tonozzi posted the second fastest time of the rodeo thus far with her mare Mona. A pair of palominos stormed to second in the round as Jimmie Smith and Stevi Hilman made runs of 16.48 seconds each. Smith was riding her mare Lena, another lefty like Pozzi Tonozzi’s Mona, while Hillman was riding Toni Dixon’s Sherlock. Hillman was just out of the first round money with her time of 16.62 seconds and took the lead in the two-run average at 33.10 seconds. Smith was just nine one-hundredths of a second behind her. On Wednesday night, the quick times continued to rain down. Washington cowgirl Teri Bangart rode her tough gelding Peak to the performance victory at 16.49 seconds. Tiany Schuster was second with a time of 16.61 seconds. Schuster earned a check in the opening round already and slotted into second behind Hillman with 33.14 seconds on two runs. The two perfs on Thursday shuffled the standings up a bit, beginning on Thursday afternoon with the reigning Prairie Circuit Champion Dona Kay Rule. Rule and her wicked fast gelding High Valor blasted around the pattern inside Will Rogers, stopping the clock at 16.43 seconds to sit second in the go. The fast time moved Rule to third in the average as Taylor Langdon took over the top spot. Langdon was behind Rule in the perf with a time of 16.66 seconds but on two runs, her time of 33.09 was one one-hundredth of a second better than Hillman. Rule is right on their heels at 33.13 seconds. As Thursday closed out with the 25th of 29 ProRodeo performances, the top of the leaderboard stood still. Andrea Busby and her horse Dial It took the victory in the performance with a fast time of 16.54 seconds. She is sixth in the go round and ninth in the average as the progressive round is now halfway done. The leaderboard for the finals is super tight at the top; only a tenth separates the top five thus far. The final hole for advancement to the short go is held by second-ranked 2019 Rookie Kylar Terlip and Wrangler NFR cowgirl Tillar Murray who are tied at 33.50. Thirty cowgirls remain including first go winner Sydni Blanchard and five more of the fastest ten from round one including reigning Fort Worth champ Amber Moore and four-time WPRA World Champ Sherry Cervi. For more information on the Fort Worth Stock Show and Rodeo, visit them on-line at www.fwssr.com. Stay tuned to www.wpra.com for continuing updates from the 2019 edition as well as the WPRA Facebook page for nightly updates on results.